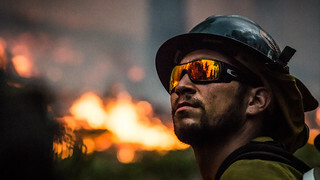 A member of the Geronimo Interagency Hotshot Crew, Department of the Interior (DOI) Indian Affairs (IA) Bureau of Indian Affairs (BIA) San Carlos Agency in Arizona; on assignment at the Big Windy Complex Wildlands Fire, approximately 15 miles west of Interstate-5 and East Northeast of Galice, Oregon, conducts a prescribed burn "burnout" operation to help stop the main fire that may head toward this roadway, on Friday, Aug 9, 2013. The primary mission of the Interagency Hotshot Crews (IHC) is to provide a safe, organized, mobile and highly skilled hand crew for all phases of wildland fire suppression. The arduous duties and specialized assignments required of IHC personnel require uniform staffing, certification, training, equipment, communications, transportation, organization, and qualifications that adhere to interagency standards and guidelines. USDA Photo by Lance Cheung.